The guys over at 1up have started playing The Legend of Zelda: A Link to the Past in what they are calling Long Form Fridays. They were originally expected to play MegaMan, but recently decided to switch to this classic Zelda title. Over the next few weeks they will be playing sequential parts of the game to give viewers an idea oh how the game goes. It will be almost like their own “lets play” of the game. 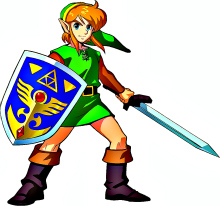 After several different suggestions for naming Link, the team went with the name Groose. They will be giving fans more chances to participate in the “lets play” by letting them give opinions and comments on their twitter. 1up definitely makes the video entertaining by asking fan questions and having their own humorous conversations. Keep reading after the jump to check the video out for yourself and learn how to participate as well. The Legend of Zelda: A Link to the Past was the first Zelda game that I played and because of that, I have an incredible amount of nostalgia for it. With that said, I hope they continue to complete the game and keep giving their own thoughts on the series. Are you going to be following along with 1up’s Long Form Fridays? Let us know what you think of the video in the comments below.